I want to hang! But I don’t think I can get a flight cheap flight from Tasmania ?. We could compare Neko Atsume kitties, do you play this? I’m packing for 2 months overseas and as I was trying to pack my makeup last night I kept thinking, what would Karen take?? ? LOL, yeah, you’re a little far from the Bay Area. I’m excited for your trip. Where are you going? I’ve covered travel makeup on the blog before, and so has Carolina, one of the interns from last year. Here’s some things to get you started. Let me know if you have any questions; I’m happy to help. Hehe, yeh a bit far! We’re off to the UK, mainly London (partner is going for work) but hoping to see a few other places while we’re there. He has family in Scotland so we’re definitely heading north. Very excited to check out all the makeup brands that aren’t available in OZ! Thank you! I have read them all! Also did a search for ‘travel’ on MBB and read lots of those posts. The one comparing what you took and what you used was super useful and reminded me that I always take products that I never use. I love the tip about using contact lens cases. Currently having trouble culling eyeshadows and lipsticks! Might have to send you a pic of what is in my bag for advice! ? If you transit or stop in the U.S., you will find that makeup here is much cheaper than Europe or most other places. Just a thought…have a great trip! Hey! Thank you!! Not stopping in the US this time but I did spend quite a bit of time there when the AUS dollar was buying $1.10 US and it was candyland! I bought SO MUCH MAKEUP! Damn it was fun. It was also when Australia didn’t have the range it has now so I was in heaven, haha. Thank you! Leaving Friday morning… eep! Just need to decide which eyeshadow palette to take ?. I’m so excited! I wish you could come. Aeeey! I live four hours away but I’m going to try to make it! I’ve been a faithful MBB fan since the Mac Fafi days Karen. We’re overdue for a visit to the Bay Area. Is there much to do in that part of Larkspur? How far is it from Sausalito and Napa? Yay, Sarah! Can’t wait to see you! 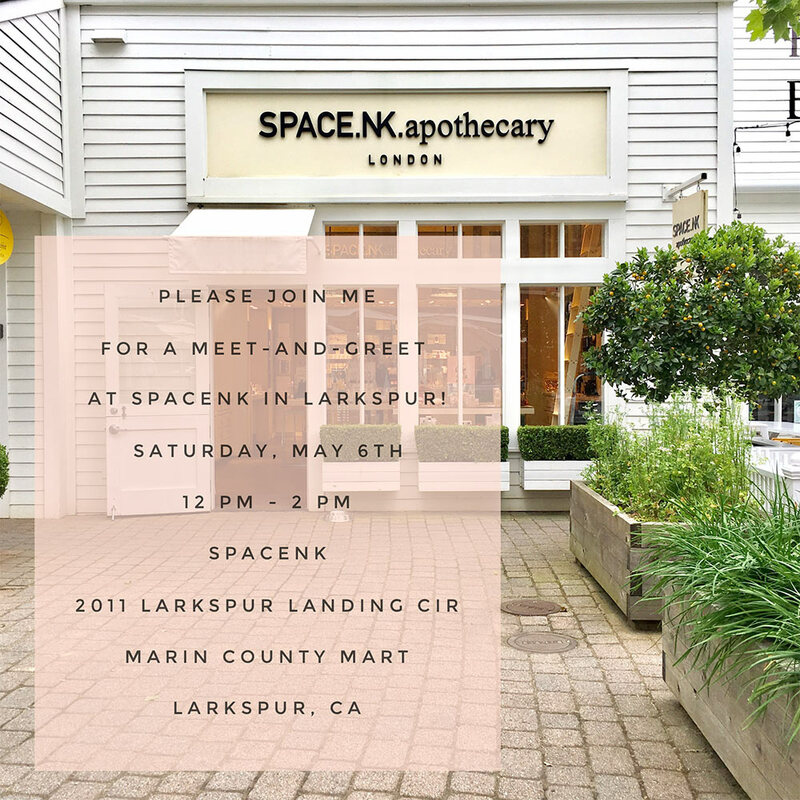 In that part of Larkspur, the Marin Country Mart, there are a few restaurants and some posh shops, and on Saturday there’s the farmers market. On Sunday, Off the Grid. Sausalito is about 15 minutes away and Napa is about 30-45 (depending on traffic). Oh, Karen! I SO wish I could come! I know I haven’t commented in forever, but life has been crazy. I’m on my fourth hospitalization in two years. I’ve been away more than I’ve been home. I’m due to go home next week, but will be stuck at home in recovery mode for awhile. I have been keeping up with the blog, though. So happy for you and El Hubs that you have that beautiful little girl! Oh, Karen, I so wish I could be there, but I am currently in the hospital, again! Fourth time in two years! It’s​ been rough. I’m due to go home next week, but will be in recovery mode for awhile. I have managed to keep up with the blog, though. Your little girl is precious! Congratulations to you and El Hubs! Give Tabs a hug for me. I will try my best to be there. Would it be ok to bring the little ones too if I can get my mom to babysit? I’m going to try to make it, Karen. I’m in San Mateo and have an appointment that will go until noon and will try to make it up from there.